Gov. Dannel P. Malloy earlier this year. Gov. Dannel P. Malloy delivered Thursday on his vow to veto the Republican budget unexpectedly passed with a handful of Democratic votes, calling it a gimmick-laden measure that would consign Hartford to bankruptcy, devastate public higher education, invite certain lawsuits from state employees and add to Connecticut’s pension liabilities. “In sum, this budget is unbalanced, unsustainable and unwise,” Malloy wrote in his message. The veto came as the state was wrapping its 13th week without a budget, continuing an impasse that Malloy says could continue indefinitely if not resolved in the next two weeks. 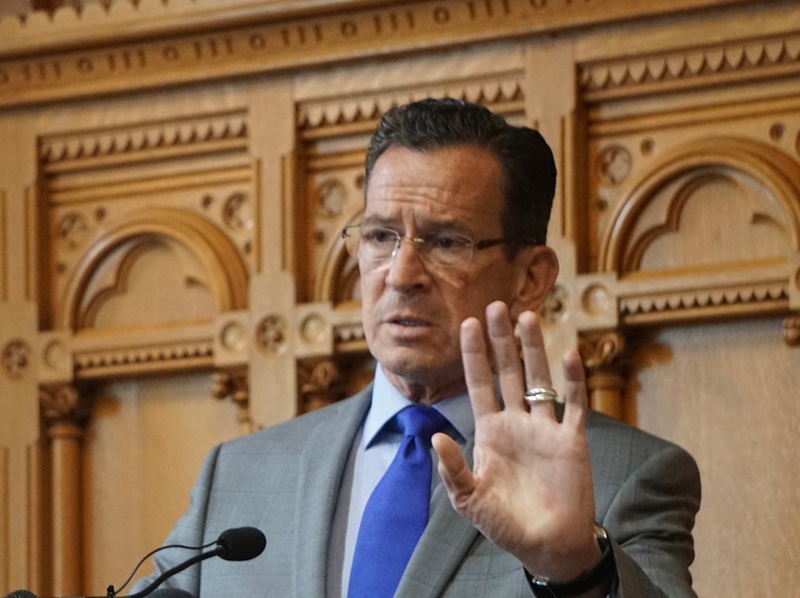 It was released on a day when Malloy resumed bipartisan negotiations with legislative leaders at the State Capitol and Republicans staged public events seeking support for a long-shot veto override attempt. An override requires a two-thirds vote: 101 votes in the House and 24 in the Senate. Republicans would have to coax 29 Democrats in the House and six in the Senate to cross the aisle and override the Democratic governor’s veto. Only five Democrats in the House and three in the Senate voted for the GOP plan. Pressure on Malloy and legislators is expected to intensify in October when the state fails to distribute education aid to most of Connecticut’s municipalities. Without a budget, Malloy says, there is no valid formula for distributing aid, other than the minimum required to meet the constitutional responsibility of providing a free and public education. And huge savings the administration would have to achieve after the budget was in force. This would mark a return to those policies, he wrote. Senate Republican leader Len Fasano of North Haven said vetoing the GOP budget opens the state to its own list of dire consequences as Malloy unilaterally makes fiscal choices as he governs by executive order. 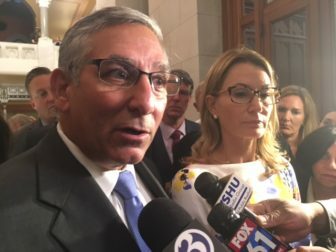 Republican legislative leaders long have argued their plan is Connecticut’s best hope of averting the much deeper cuts Malloy must impose in the absence of any adopted spending plan. The Republican budget incorporates savings from the concessions deal unions and Malloy struck earlier this year, as does a compromise plan reached by the governor and Democratic leaders. But while that concessions deal also locks the state employees’ benefits package into place through 2027, Republicans said Connecticut can save even more money now by limiting the pension benefits offered after that date. Malloy said in his veto message the GOP savings are based on nothing more than hopes and wishes for what might be negotiated a decade from now. “This budget grabs ‘savings’ today on the false promise of change a decade from now, a promise that cannot be made because no legislature can unilaterally bind a future legislature,” Malloy wrote. “It eliminates $144 million in pension contributions this fiscal year, $177.8 million next year, and hundreds of millions of dollars in the years to come, solely by seeking to limit the state’s authority to enter into future agreements over pension benefits. Many Democratic legislators and union leaders also have questioned whether the state can make these changes unilaterally or whether that would violate collective bargaining rules. Malloy said the GOP plan also adds to the unfunded liability in the teacher’s retirement system, whose costs are now borne by the state. The GOP plan would increase teacher contributions, without depositing them in the pension fund. Union leaders say that amounts to a new tax on teachers. Pension liabilities loom large in Connecticut’s fiscal problems. Analysts say state finances, unless adjusted, would run $1.6 billion in deficit this fiscal year and $1.9 billion in the red in 2018-19. Much of that shortfall is driven by surging retirement benefit and other debt costs fixed by contract, and also by declining income tax receipts. Malloy has said much of the reductions he would have to make to keep spending in line with revenues would fall upon municipal aid and social service programs for the poor and disabled. The Republican plan does preserve more aid to municipalities than would a Democratic alternative. In his budget message, the governor said that is illusory. The $40.68 billion, two-year budget crafted by the GOP effectively holds the line in spending. On paper, general fund spending would increase 3.5 percent in the first year and another 0.6 percent in the second, despite surging retirement benefit and debt costs fixed by contract. But like the last budget recommended by Malloy and Democratic legislative leaders, the GOP budget’s growth also is inflated by a major new tax increase on hospitals, which also calls for the state to return all of those funds and more to the industry. This is done to capture hundreds of millions in new federal aid as both the state and the hospital come out ahead. Malloy said that Medicaid revenue was in jeopardy. “I cannot overstate the urgency of the need for all parties to come together to negotiate a realistic, responsible budget that addresses our state’s fiscal issues, distributes education aid equitably, and balances without the use of illusory gimmicks,” he wrote. “And I must note that failure to reach a deal soon could risk federal approval for $343.9 million in increased provider tax revenue and $366.5 million in federal Medicaid reimbursement, which are critical to balancing the budget and increasing reimbursements to providers. The Republican budget also would have established strong caps on appropriations and borrowing, while sparing communities from major cuts in state aid and from the governor’s proposal to shift $280 million in teacher pension costs onto local budgets. Both the GOP budget as well as the Democratic plan have been criticized as being unsustainable. The legislature’s nonpartisan Office of Fiscal Analysis says the GOP-crafted plan would balance the state’s books this fiscal year and next — wiping out the $3.5 billion potential deficit in the process. And the alternative budget developed by Malloy and Democratic legislative leadership would fare even worse, with a potential shortfall of $3.58 billion. That’s in part because Connecticut still must deal with surging debt and retirement benefit costs — much of which stem from more than seven decades of insufficient savings. This problem is projected to plague state finances through the mid-2030s.